Most people know about the Heart Line in Palmistry, which represents your approach to love and commitment. Some people even have a second Heart Line, which floats above the first. This is called a Girdle of Venus (see photo).The Girdle of Venus may be complete (as in the picture) or, more often, composed of broken or overlapping lines.This marking has a negative reputation in Palmistry, which I’d love to overturn in this blog. In traditional Palmistry, the Girdle of Venus is associated with insecurity in love and inner restlessness. In modern Palmistry, The Girdle of Venus can be considered a powerful sign of psychic, creative and emotional sensitivity. As a numerologist and palmreader, I believe that each person has a set lifepath and life lessons that they’re here to achieve. I’ve read that you can ONLY change your karma when you have a strong heart chakra. It’s possible that some people have a Girdle of Venus because they wanted to strengthen their heart chakra in this lifetime, to increase their soul’s level of compassion. -You feel life deeply, and can be a gifted spiritual teacher, healer, writer, artist of actor. It would be easy for you to become religious at some stage in life. Many people with this marking are performers, who find it hard to express their feelings until they have the support of an audience. What a gift to everyone…they’re Spiritual Messengers (and often 11:11 Starseeds), reminding us it’s ok to be human. -Everything is alive for you, trees, nature, even inanimate objects. -It’s easy for you to empathise with people or animals in pain, which makes you more likely to become involved in charitable causes. -You don’t need much criticism to change, you already have an active conscience and know what’s right and wrong. -As you have chosen a lifelong journey of heart healing, you’ll meet and influence many people along the way, e.g. through attending therapy, groups, classes and teaching other sensitives how to handle everyday life. You’ll never be short of friends for this reason. -You’re likely to look into spirituality and religion to find the true Source of unconditional love in the Universe. Remember, G.O.D simply stands for Good Orderly Direction (see The Artist’s Way). -You know when people are flirting with you and can be charismatic in social situations. -By the end of your life you will have (hopefully) learned how to forgive others, including yourself, to find your innocence again. -You may have suffered trauma (usually as a child or before age 15) which led to you losing trust in the people around you. This marking is associated with past difficulties such as early exposure to conflict and stress. A gifted palmreader can pinpoint the age/s at which your Girdle of Venus formed. I have done this before, having learned the skill from Paul Fenton-Smith. It’s worth noting that you can have a Girdle of Venus in one hand but not the other (check if it’s the Active or Passive hand – the Active is your writing hand/ current energies). This indicates if you experienced the trauma in a past life/ childhood (Passive hand only) or as an adult (Active hand only). 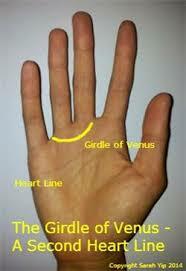 I have a Girdle of Venus in my Passive hand and a lighter one in my Active hand. This makes sense as I have pursued self-help and healing for over a decade. I know what sets me off, and have many people on call (including Spirits) when I need assistance. -You may need counselling or support to heal your hurts during this lifetime. Music or art therapy could also help. If you try to keep everything inside this could lead to inner turmoil and depression. -You need to practice setting appropriate boundaries with other people, including energetic boundaries (by cutting cords etc). If you have a low-set Mercury finger and many relationship lines you’re learning to say NO to unfaithfulness in your relationships, be it physical or emotional distractions (that includes iPhone addictions!). -If someone close to you is in pain, you’re more likely than most to pick up on their feelings. So it can take you longer to heal from breakups or deaths around you. You also need to find ways to turn off from work so you don’t burn out from worry. -If you have a Girdle of Venus and markings such as an Allergy Line or many fine lines overall, you may be prone to digestive issues. There can be blocks around receiving love and adequate nutrition. This would also be highlighted by vertical ridges on your nails. Taking digestive or nerve tonics, or seeing a naturopath or Chinese Medicine practitioner may be helpful. 1) Acknowledge your sensitivity and use it constructively e.g. through imaginative work. Surround yourself with people who speak kindly and support your dreams. 2) Overcome your natural self-criticism (read this blog) Get help or study healing/ Holistic counselling so you can let go of the past and receive your good. 3) Learn to receive love, be it through massage, keeping pets or even being around kids and people who are emotionally secure. The books Attached, The Mastery of Love and Loving What Is may be helpful. I also adore The Five Love Languages. 4) Research Palmistry (I have lots of articles into this blog, e.g. see my Medical Stigmata and St Andrew’s Cross posts) and Numerology. When you know your soul contract, you’ll understand why you’ve attracted particular traumas and how you can find your soulmates this lifetime, be they romantic or spiritual. And a bonus tip: consider doing Kundalini Yoga or Tantra. Girdles can appear on people who need to let go of control and relax during intimacy. Breathwork and yoga are particularly helpful for creating this balance. Speaking from experience, one of the best parts about having a Girdle of Venus is that it ‘makes you feel’ – it forces you to connect with other Lightworkers out there to share your wisdom. It gives you a reason to seek a deeper truth to life. I hope you’ve enjoyed this article on the Girdle of Venus. The St Andrew’s Cross – Will You Save Lives?